Dragon fruit is an epiphyte which categorized under the family of Cactaceae, which is scientifically named as Hylocereus undatus. It is a perennial plant. Origin if this plant is in Middle and South America and there it is called as "Pitaya". Dragon fruit is currently cultivating in Vietnam, Thailand, Malaysia and Israel as a commercial fruit. This can be successfully grown in tropical climate. Dragon fruit plant is popular as a fruit and also in horticulture. Ripped fruit can directly get to eat. And this also uses in Jam, ice cream, jelly, fruit juice and vine products. Dragon fruit blossom can get to eat as a cooked food. This fruit increases the ability of food digestion. And also has abilities of beating cancers and controlling diabetes, blood cholesterol, blood pressure. Following are the nutrients in 100g of ripped dragon fruit. 82.5g of water, 0.159g of protein, 0.21g of fat, 0.7g of rough fiber, 0.005mg of carotene, 6.3mg of calcium, 30.2mg of phosphorus, 0.55mg of iron, 0.28mg of vitamin B1, 0.043mg of vitamin B2, 0.297mg of vitamin B3, 8.0mg of vitamin C, 0.28mg of thiomin, 0.043mg of riboflavin, 1.297mg of niacin, 0.28g of ash and 0.54g of other nutrients. There are lot of varieties of family Cactaceae are cultivating as commercial fruit around the world. Those are species of Hylocereus, Selenicereus and hybrid. Among all those species Hylocereus undatus is commonly spread as the dragon fruit. This plant is also famous as a beautiful horticultural plant. Ripped fruit is weight over than 1kg. Bark is red in color. Core is white in color. 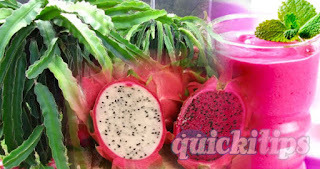 Dragon fruit also named as Pitaya and Strawberry Pear around the world. The species of Hylocereus polyrhizus fruit is weight around 1kg. Bark is red and core is also red in color. There are more spines on stem. Selenicerus megalanthus has a yellow bark and white core. This species is called as Yellow Pitaya. There are spread black tiny seeds in core of both of the above species. Dragon fruit is a plant of a Cactaceae family. Therefore it can bear low water levels, low nutritional soil status and high temperature. But the most suitable is 20-30 Celsius temperature and tropical climate. Best range of rainfall is 500-1500 ml per year and shifted dry and wet environment is better. Plant needs good sunlight but high sunlight for a long time is not suitable and a shade must be supplied if any. A good water drained soil is better and 10-30% sand soil gives best results. Dragon fruit plant is like to organic fertilizer very much. Propagation can be done by planting stem cuts and seeds. There are a long time spend to propagate using seeds. Therefore this method is not commercially used. There is another reason for this. Properties of the second generation can be differ than the mother generation using seed propagation. When getting stem cuts, you have to choose best cropping plants. Cut stems should no more than 15-20cm long. Store one or two days in a dry place before plant. After that plant these stem cuts in pots filled with good water draining soil media. Use 1:1:2 mixture of dry compost, top soil and sand as the filling media. Keep planted pots in general wet shaded environment to rooting. After grow branches then train them to the normal environment and go for plantation. When planting such pre-established dragon fruit babies, dig 60x60x60cm pits with the distance of 2x2m in distance between adjacent. Fill those pits with top soil, 10-15kg of compost and 100g of super phosphate mixture. If the water drain is low in soil lay 1-2 layers of piece of bricks to the bottom of the pit. Mix extra sand to the above mixture. These plants need a supporter to grow high. Therefore fix a 5-6 feet high concrete or wooden pillar to support the plant. Bind the growing stem to the pillar. Limit the lateral buds and let only two or three main stems to grow. Remove excess lateral buds. Fix 2 feet diameter wire circle on top of the pillar. Train the plant to spread branches on that circle. Invasion of diseases is very low for this plant. Some fungi has recorded from several places. Flowers are nocturnal and white in color. Flower has a pleasant smell and it is called "Queen of night", "Moon flower", "Noble woman" because of its beauty. Fruits become mature 30-35 days after blooming. Dragon fruit can crop for about 6 months per year. During this fruity period crops can get for 5-6 times. When supplying organic fertilizer to dragon fruit start it from 15kg per year, per plant. Then increase the amount by 2kg per year and do not exceed the total over 20kg. Use inorganic fertilizer in first ages, in ages the plant not bearing fruits. Use a mixture of 72g of Urea, 88g of super phosphate and 40g of muriate of potash after one month of planting. Repeat apply this mixture once in 4 months. When fertilizing fruiting plants you have to use high Potash and low nitrogen content. Use 50g or urea, 50g of super phosphate and 100g of muriate of potash mixture per tree per one time. Fertilize once before blooming, second is on fruit growing state and the third is after collecting crop. Increase the amount of fertilizer per plant in 225g per year. But do not exceed 1.5kg. Good water supply is compulsory for a good crop. Store the collected crop in 5 degrees Celsius and 90% humidity. Fruits can store maximum 40 days under these conditions without any quality loss.